Have you skied Jay Peak lately? This northern Vermont ski resort has seen a transformation, with three new slopeside hotels, a big beautiful Pump House waterpark, and an Ice Haus. 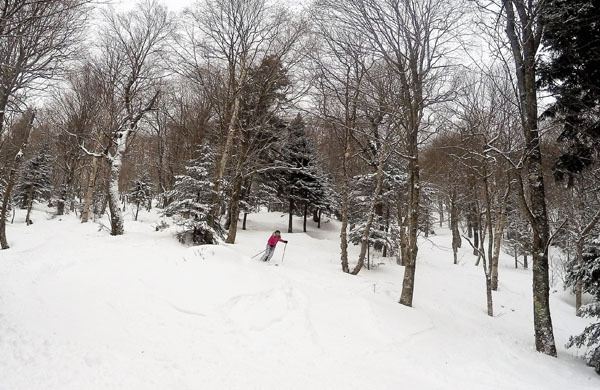 What hasn’t changed at Jay Peak is the terrain, two mountain areas, Stateside and Tramside, offering classic New England trail skiing on trademark runs Vermonter, Ullr, and loads of low angle glades plus grittier tree skiing mid mountain. Jay’s signature lift is the Tram, Vermont’s only aerial tram. Jay Peak is 2,153’ vertical, 7-minute tram laps get you the full feel from the panoramic Peak skiing all the way to the base, while the Bonaventure quad gains you the majority and sweeping views on Can Am all the way to Canada. The Green Mountain Flyer is the longest detach quad in the Northeast – perhaps that’s why its nicknamed the Freezer – a swift ride straight into the wind accesses classic runs JFK, Green Mountain Boys, Goat, plus bounteous glades to the west. While Jay’s mid-mountain has some pitch, the lower third rolls out to very tame terrain – take your pick of beautiful well-spaced glades or groomed mellow boulevards. Jay Peak gets a lot of snow, a northernmost location, upwards of 350′ in a good snow season. It’s often snowing at Jay and the Peak is in the clouds – they call it the Jay cloud effect. Jay has an international feel – the European tram, the alpine style Tram Haus lodge, trails like Kitzbühel, UN and Jet, and a contingent of Canadian skiers and Asians of late. These factors give Jay a paradoxical vibe – down to earth liftees and locals enjoy tree skiing in woolies and punny signage, while modern hotels grace the revitalized base, even a Miso Hungry noodle café out of a tram car. Glide thru Jay’s snow ghosted trees or carving groomers, you can ski right to your hotel. Hotel Jay is the biggest and most posh, with valet, floor to ceiling slope view windows, and your lift ticket is your room key – cool RFID technology. The piece de la resistance, lots of Quebec French spoken so close to the border, is the Hotel’s direct access to the Pump House Waterpark. Kids will love this awesome 60,000-sq-ft aqua park of pools, slides, a surf rider, a lazy river, and bucket gushers. Parents can partake in surfing, La Chute – the crazy loop de loop slide, or soak then sip a beverage overlooking the entire park from The Drink Bar (thankfully there are lifeguards if you aren’t eagle eye). The Ice Haus next door is a full ice arena for skating and hockey competition if you’re not wrung out like a wash cloth after skiing and splashing. Dining and après ski at Jay Peak, Hotel Jay’s Foundry offers wood fired pizza, Vermont cheddar burgers and local fare with nice views of the mountain, Or you can walk to Tram Haus – another alpine themed hotel next to the Tram, for the legendary Alice’s Table restaurant and Tower Bar popular for après ski with slope views. The third and most affordable lodging, beside plentiful condos, is Stateside Hotel at the base of the Jet Triple and Bonaventure quad chairs and nearest to the Children’s Learning center if you’re putting kids in lessons. Jay Peak has Top Après Ski Bars. Jay Peak is now in receivership after owners Bill Stenger and partner Ariel Quiros built three hotels and a waterpark, plus bought Burke Mountain in 2012, but were accused of a ski ponzi scheme much of the EBF funds raised were unaccounted for spring of 2016. Go ski Jay Peak and Burke Mountain in the North East Kingdom of Vermont while you can.